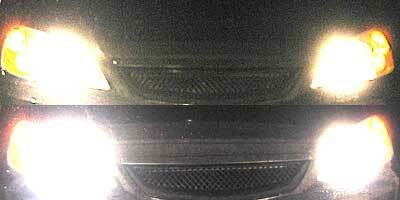 I’ve tried a multitude of street legal bulbs for my headlights. Let’s see I started out with the OEM Osram/Sylvannia bulbs that come standard on pretty much most vehicles. From there I went with the Sylvania Cool Blue bulbs. These ones simply remove the yellowish tinge from OEM lights but did nothing to extend the range. From there I went on to the Sylvania SilverStars which are supposed to put out 50% more light onto the road. With these I did notice an immediate difference in the distance of how far the lights went. I switched over to the Osram Silver Stars which are the same as the Sylvania bulbs. Difference being I picked up the Euro Spec bulbs therefore they are technically not DOT compliant. However the E spec and DOT requirements are pretty much the same so I consider them “legal” plus I’ve never had any cop examine the lettering on the bulb anyways (not that they could without being blinded by the light). Anyways the Osram bulb’s main difference is it doesn’t have that blue coating on the bulb. So for the Sylvania Silver Stars the light looks whiter as opposed to the Osram bulbs. Now I’ve gone on to try these Powerbulbs brand which is from the UK. Apparently they manufacturer OEM bulbs. I’m thinking they’re probably from a pre-branded factory manufacturer. 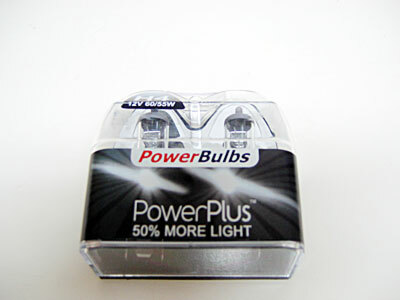 I’ve got the PowerPlus bulbs which are the 50% more light type of bulb. Generally these newer 50% bulbs get that extra light output by using Xenon gas in the bulb instead of the standard Halogen. After some very non-technical means of guaging the distance of the light (i keep a check on how far down my street i can see from my driveway), I think these bulbs actually perform better than the Osram bulbs. Here’s my quick breakdown. Sylvania Cool Blue bulbs burn out faster than OEM bulbs and provide only a minor lighting upgrade. Osram or Sylvania Silver Star bulbs are an improvement over stock and lasted me about a year and a half. PowerBulbs PowerPlus seem to be fairing well so far..
Here’s a comparison picture of stock OEM Halogen Bulbs versus the PowerPlus Xenon Bulbs. 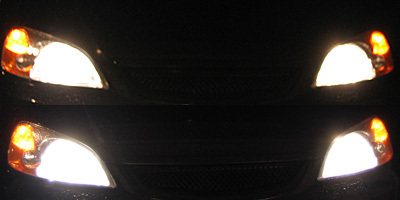 The headlights on top are the stock OEM bulbs. The bulbs on the bottom are the PowerPlus bulbs. You can notice how the colour is different in the light output due to the difference in gases that the bulbs use. With this image I ramped up the levels in photoshop to enhance the photo a little more. You can see that the visible light output of the new bulbs is definitely more than the stock. Also the colour temperature is different and is enhanced by this photo. Perhaps later on I may post the histograms for the image for both bulbs for the geeks out there. EDIT: I forgot to link to where you can get these. Along with all the other bulbs mentioned they’re sold through Powerbulbs they sell them usually 2 for 1 and free shipping worldwide and very very reasonable prices. I haven’t been able to find their bulbs sold cheaper anywhere else online or in store. Especially if you’re going with the name brand bulbs like Philips and Sylvania / Osram. Enjoy!